Hello makers! Today I am hosting a quick sewalong for the Reno Bikini top from Seamwork Magazine. I was so pleased with my first make of this pattern that I decided to share the steps involved to encourage others to give this pattern a try. It’s a pretty quick make, so I won’t be extending this into a multi-post sewalong. I hope that’s alright for you guys, feel free to break up the process where ever you like 🙂 The entire project (printing and taping and cutting included) took me 5 hours. If you haven’t already, head over to the Seamwork Magazine site and sign up for a subscription. With your subscription you will receive two pattern credits a month to spend on any of the patterns in their backlog of issues, like the Reno Bikini Top. Once you have the pattern it is up to you if you would like to continue your subscription. Each month there are two new patterns so it is a pretty great deal. Disclaimer: I was not asked by Seamwork to do this sewalong, all opinions expressed in this post are my own. If you have not sewn with knit fabrics before, there are a few things you need to know. Your seams need to stretch with your fabric, otherwise, the thread will break and your seams will pop open. This can be easily accomplished using a serger or overlocker, but a zig-zag stitch will also provide you with enough give in your seams so they can stretch and the threads won’t break. I don’t have an overlocker so I will be using a zig-zag stitch for this sewalong. Seam allowances for this pattern are 3/8″. The reason for this is that 3/8″ is the standard seam allowance on most overlock machines. Use a ballpoint (or jersey) needle. This type of needle has a slightly rounded tip which stops the needle from tearing the fibres in your knit. You may also experience skipped stitches if you try to use a regular needle. Once you have printed, taped, and cut out your PDF pattern, you can cut out your main fabric and lining fabric. Please refer to the Seamwork instruction booklet for pattern cutting layouts. You can see all my fabric pieces below. In addition to the main and lining fabric, you will also need about 8″ (20cm) of boning and 1/4″ wide rubber elastic. I am also adding two thin foam cups to my top for extra support, this is completely optional. First, we will make the side ties. Place your back tie pieces right sides together and pin along the long edges and the small side edge. Do this for both back ties. 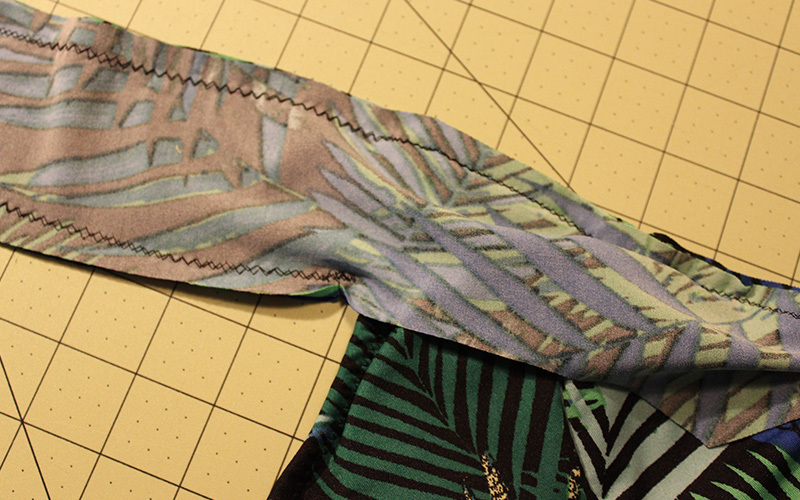 Sew along three sides of the ties using a zig-zag stitch or a serger. Use a wider zig-zag stitch here because the ties will stretch out a lot when being pulled. Once sewn, trim the corners and turn the ties right side out. Press on a low heat, taking care not to burn your fabric. Sandwich one of your ties between the main fabric and lining fabric under-bust pieces. Your main and lining fabrics should be right sides facing. The tie should sit about 3/8″ in from the top and bottom edge of the under-bust pieces. This is because we need the extra fabric for sewing on the elastic later. Pin and sew along this edge using a narrow zig-zag stitch. For seams that will be under a lot of strain, I like to go over them twice with a zig-zag stitch to ensure they will not pop. This is optional. If you are using a serger you only need to sew the seam once. Repeat this step for the other side of the suit. Turn the under-bust pieces to face wrong sides together and press the side seam on a low heat. Check your boning to see how wide your boning channel needs to be. I got 1/2″ wide boning because they didn’t have 3/8″ as instructed, so my boning channel needs to be a bit wider. Important! Pad the boning ends with tightly woven cotton squares to prevent the rods from poking out. I did not do this and the ends of the boning in my suit were poking through the fabric and stabbing me in the side – ouch! 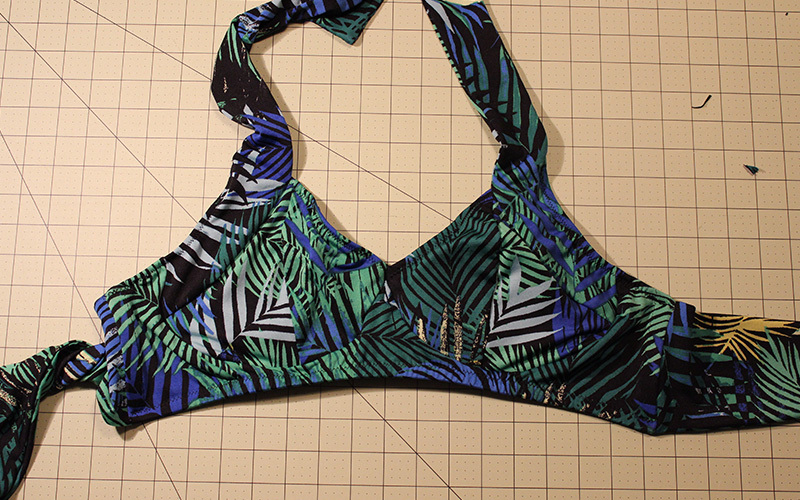 Sew the under-bust pieces together to create the boning channel using a small zig-zag stitch. We will insert the boing last, set it aside for now. Next, we will be constructing the cups of the suit. Lay out your pieces as shown below to make sure you are sewing the correct edges together. With right sides facing, pin and sew along the center seam of the cups using a small zig-zag stitch. This is another seam that you can go over twice to ensure it is very stable. Gently press the center seam to one side. If you would like to join me in adding a small foam cup you can do this now. Place your cup on the wrong side of the bust pieces. Don’t worry if the cup is not the exact size and shape of the suit pieces. Pin the cups along the bottom edge of the bust pieces, you will likely have fabric on either side of the foam cups, center is as best you can. Baste the cups in place along the bottom edge using a zig-zag stitch. Once basted, I like to sew a very small stitch in the middle of the bust piece to tack the foam cup in place. This helps to ensure it doesn’t shift around while you are wearing the suit or get all bunched up in the wash. You want to stretch the bust fabric a little over the cup before tacking it down. You can do this by hand or by machine, I used the machine because it is fast and the busy print on my fabric will hide the tack nicely. 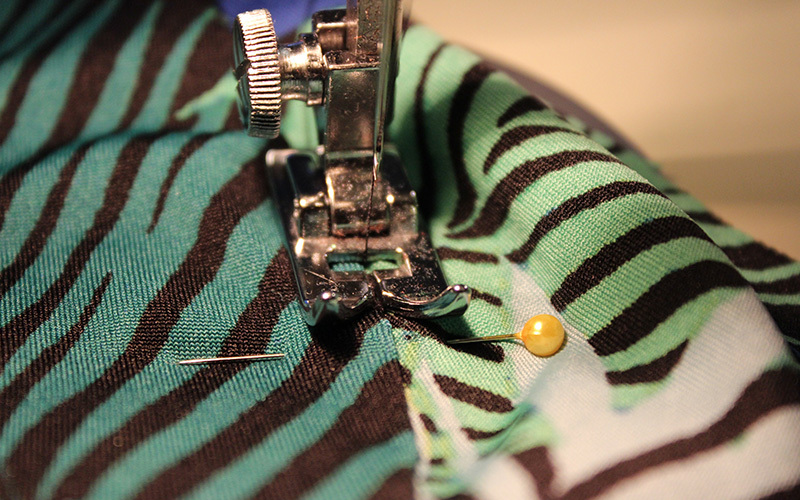 Use a straight stitch and sew a few stitches right in the ditch of the center bust seam. From the reverse side, your foam cup basting and tack should look like this. Next, we will be attaching the lining and fabric bust pieces together. Match up the shapes with wrong sides facing. Pin and sew along all three sides with a wide basting zig-zag. Once the lining and fabric cups are attached, we will be inserting our first piece of elastic along the shortest edge. When sewing in swimsuit elastic, you want the elastic to pull the suit just enough to add support and sit snug on the body. We accomplish this by stretching the elastic as we sew it on. If you stretch it too much, the swimsuit may feel too tight, or if you don’t stretch it enough, the suit will feel loose. A general rule of thumb is that your elastic should be about 15-20% shorter than the length of the edge you are attaching it to. I like to cut a piece of elastic the length of the edge and instead of cutting the extra 15-20% off, I use it as a tail when I am sewing. This is especially helpful at the end of the edge when the elastic can slip out of your fingers and be difficult to handle. When sewing longer edges, it is better to measure the elastic 15-20% shorter and then add a 1″ tail. Then you can pin the elastic evenly along the edge so you get an even amount of stretch as you sew. As you can see in the pictures below, I am stretching the elastic out past the end of my fabric as I sew the edge. You want to sew the elastic down using a wide zig-zag stitch. Do not stretch the fabric, only stretch the elastic as you sew. Leave a small sliver of fabric to the right of the elastic, so when you fold the edge over, the elastic is completely hidden. When you get the end, having an elastic tail is very helpful. Once the elastic is attached, fold over the edge and topstitch the elastic using a wide 3-step zig-zag stitch. If you don’t have a three step stitch, a regular zig-zag will do. Remember to pull the elastic as you sew so the stretch is even. Once sewn, the edge of your cups will look something like this. Trim off the elastic tail if you have one. At this point, lay out your suit so you can see how it will come together. I made the mistake of sewing my cups on wrong the first time, with the shorter edges facing out, so it is good to see how it all fits before sewing. You will have four neck tie pieces, so if you are working with a print, now is the time to decide which pieces will face out and which will face towards your body. Sandwich the cups between the neck tie pieces with right sides facing. Pin along the edges, stopping at the circle mark on the tie. Sew the ties to the cup using a narrow zig-zag stitch. 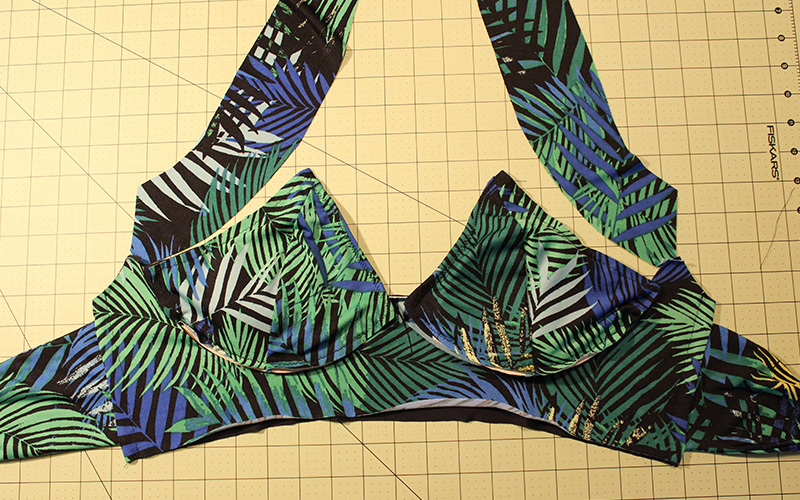 Then, switch to a wider zig-zag stitch for the rest of the neck tie piece because these will need a lot of stretch when putting the swimsuit on. I went over this seam twice, as you can see in the image below. Clip the corners of the tie ends and turn the ties right side out. Press on a low heat. Clip in to the circle mark on the unstitched edge of the neck tie. This lets us fold out the seam allowance so we can attach the elastic later. To make the next step easier, you can baste the under-bust fabric and lining together first if you like. Begin pinning the cups to the under-bust fabric and lining, right sides facing. Pin all the way around and then sew using a narrow zig-zag stitch. Again, you can go over this seam twice. Repeat this step for the other cup. I had some trouble where the cups meet in the middle, it is hard to get them to sit perfectly next to each other. I ended up sewing the cups together a little bit where they meet in the middle instead of doing the bar tack. I hope yours goes more smoothly than mine, but if not, you could try something similar to what I did. Next we will be attaching elastic to the outer edge of the neck ties. Do the same as you did for the inner bust, using the ‘elastic tail’ method if you like. First sew the elastic to the inside edge of the suit and then fold the edge over and top stitch it in place. Lastly, we will be sewing elastic to the bottom edge of the under-bust. Before doing this final step, insert your boning into the boning channels. You can make this next step easier by basting the lining and fabric together before attaching the elastic. I unfortunately didn’t take a picture of this step, I was too excited to try it on! The method is similar to the other elastic we have inserted, but since the edge is longer, it is a good idea to pin before sewing so you get an even distribution of stretch. Pin both ends, then the center, then the center of each side. Five pins should be sufficient. Sew the elastic to the edge and then fold it under and top-stitch. Take care not to sew over your boning, stretch out the edge to avoid it if you need to. This is also your last chance to shorten your boning pieces if they are a bit too long. I decided to make the Bombshell Bikini bottoms from Closet Case Files to go with this Reno top, but it also looks great with the Seamwork Dakota bottoms that I made to go with my first Reno top, you can see some pictures below. I hope you enjoy sewing the Reno. Check back on Friday for more photos of my completed bombshell bikini bottoms and Reno Top combo. Thanks for sewing along! Thanks for this concise sew-along and for sharing your minor mistakes too! I would have make the same mistake as you with the bonings. Thanks, Hélén! I totally didn’t thing about the sharp ends of the boning, the nylon fabric is definitely not thick enough to cushion it though! Thank you for all this information! It will definitely help me to sew mine. Thank you for sharing minor mistakes as well, they are not noticeable at all! Thanks for this! I just signed up for Seamwork at the start of February and was really eying these patterns but the Oslo and Astoria won with their snugly winter appeal. Now, seeing your beautiful examples of Reno/Dakota, I think I better snag these with next months credits! Thanks Margo! The Reno and bombshell go great together, good luck with your set! Beautiful suit! And that fabric is amazing! Do you remember the name of it or if you purchased it online? I live in a small town in Northern Ontario and unfortunately our fabric selection is so small. I would love something similar to this! Great job! Thanks Mana! I bought it at a local store here in Vancouver called Dressew. Unfortunately they do not sell online 🙁 I hope you find something similar! So I tried making this today. And looking at this made me realize my mistake. I am pretty sure I put the cups in wrong. No wonder it was SO low cut and far apart!! Urgh!! I have not messed up that bad in a long time! !